With over a year and a half in design, development, and materials testing, Z1 Motorsports’ ultra-lightweight two-piece rotors are now available. Tipping the scales at a scant 20 pounds per rotor, our two-piece design loses 10 pounds compared to the stock 30 pound Akebono sport rotors, a weight savings of 33%. By significantly reducing the rotors’ unsprung mass, the front of your Juke comes to life, resulting in noticeably more nimble handling, sharper turn-in, and remarkable response, all while allowing the car to be pushed deeper into the braking zone. A two-piece design drops weight by 10 pounds per rotor, 20 pounds total of unsprung mass. Lightweight rotor hats are machined from forged 6061 aluminum blanks, and finished with heat treating and premium black-hard anodizing. Alloy rotor irons are heat-treated and stress relieved to deliver the best performance in all conditions. This process keeps the disc stable at extreme temperatures and minimizes the effects of warping and cracking, resulting in increased rotor life and maximized performance. Held to precise specifications, rotors are dynamically balanced after assembly and precision parallel ground. 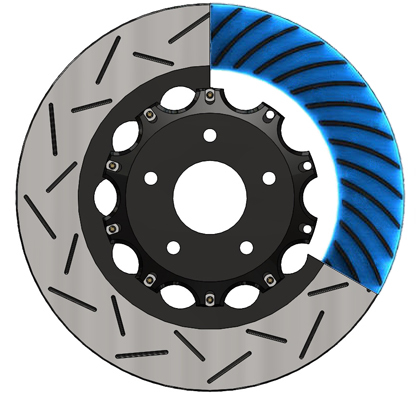 Available in high performance slotted or drilled & slotted rotor configuration. Built by enthusiasts for enthusiasts: in addition to top-tier performance, rotor rebuild cost was a priority consideration; also available HERE are the same rotor irons as part of a two-piece rotor rebuild kit. So go ahead, take 20 pounds off the front axle, you won't be disappointed. NOTE: These rotors are intended to be used with 370Z / G37 Sport Akebono Calipers ONLY and will not fit with standard calipers. If you do not have a set of Akebono Calipers and would like to purchase a set, contact us via phone or product questions below and we'll be happy to build you a kit! Response: Hey Andrew, no spacer required here! These rotor hats are built Juke specific so no special modifications or additional parts are required. I'll contact you directly in response to your other questions.